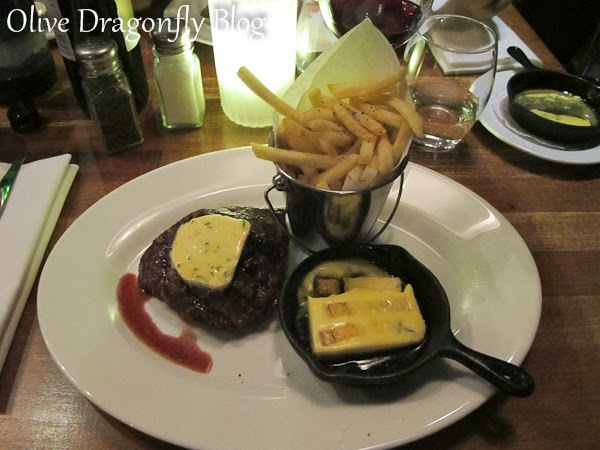 Nik and I went out for dinner on Wednesday night and really enjoyed the steak, fries & wine deal (it also includes burgers) at Butchershop Bar & Grill. 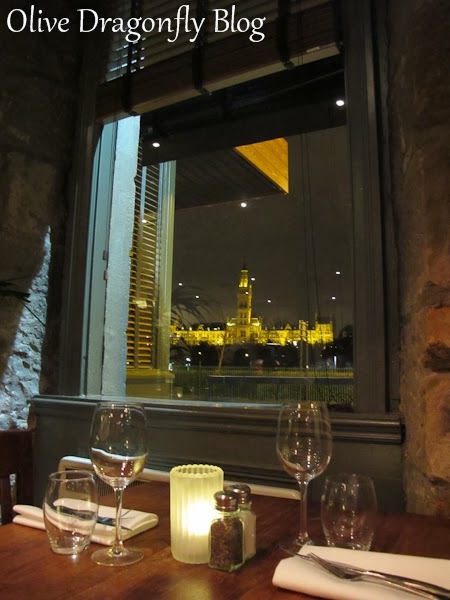 (They usually only do that deal on a Tuesday, but during January they're offering it Mon, Tues and Wed.) We highly recommend it, the rump steak was beautifully cooked and so delicious, the bottle of wine that was included was Sangiovese and was also very nice, all for just £30. Lovely view of the university. 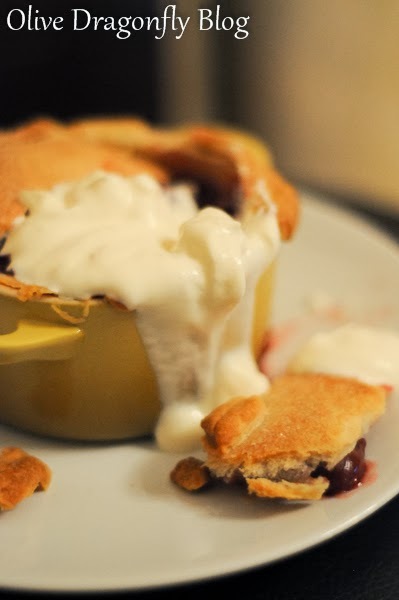 For some reason after dinner I really fancied cherry pie, there wasn't any in the Tesco we found nearby so we made do with mini cupcakes but I couldn't get over the thought of cherry pie so I made some the next evening! I googled to read a few recipes before deciding how to make mine taking ideas from a few different recipes. They turned out really well despite my ready-rolled shortcrust pastry being a week or so out of date, oops! 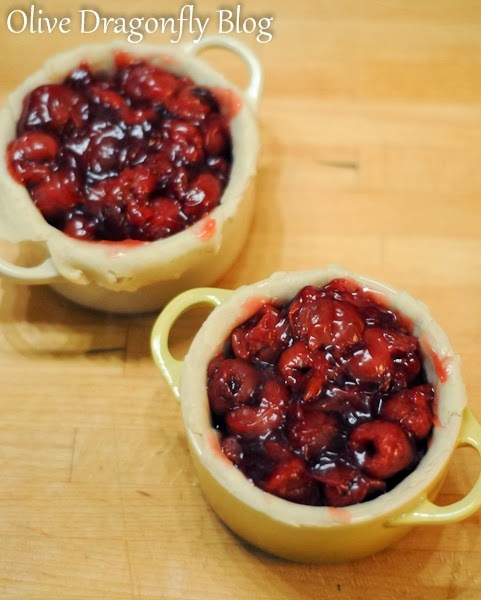 Place the cherries, sugar, lemon juice, salt, Kirsch and vanilla & almond extracts into a pan and heat over a low heat. 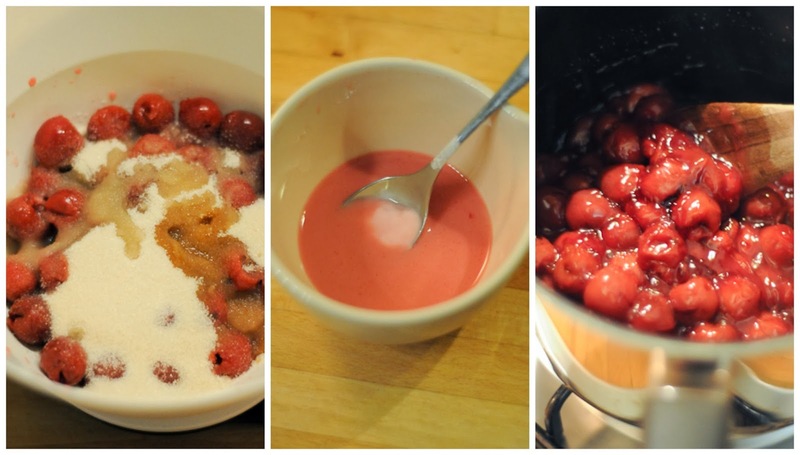 Mix the cornflour into the cherry juice/syrup and add to the cherry mixture, stir and keep over a low heat, stirring occasionally until it becomes thick. Preheat the oven to 190oC. 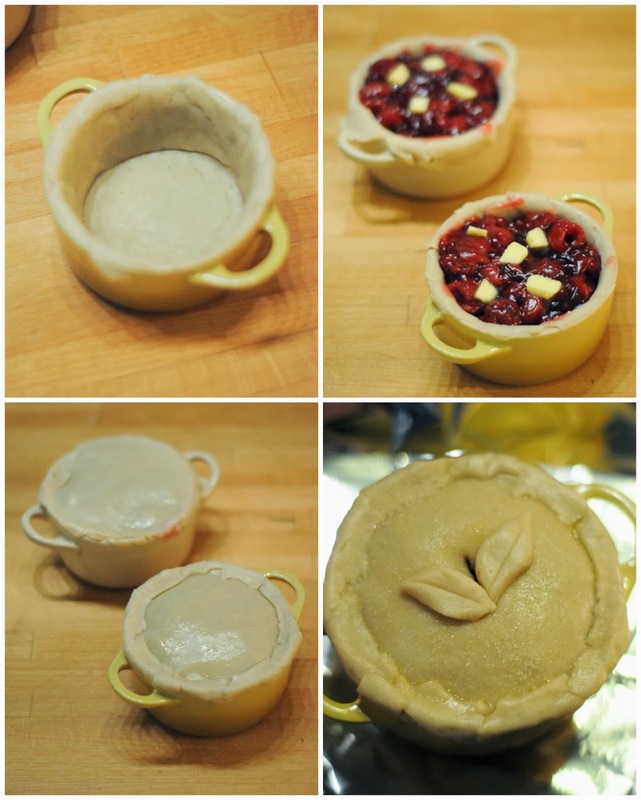 Roll out the pastry and line your pie dish(es) with it, my pies are very rustic, I didn't spend long making them look pretty as I just wanted them done asap ;) Fill with the cherry mixture and add the small knobs of butter on top before placing the pastry lids and sealing the edges. (You could spend a bit more time here and do a much better job than me! I cut the lids too small and had to add more round the edges to seal it.) Spread a little melted butter over the top and sprinkle with sugar. Cut a small slit to allow steam to escape. 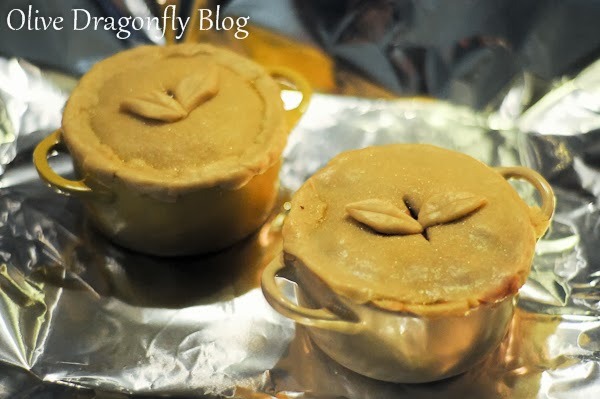 I didn't like how this made them look so I disguised it with some little pastry leaves. My dishes are 4" in diameter and almost 2" deep. 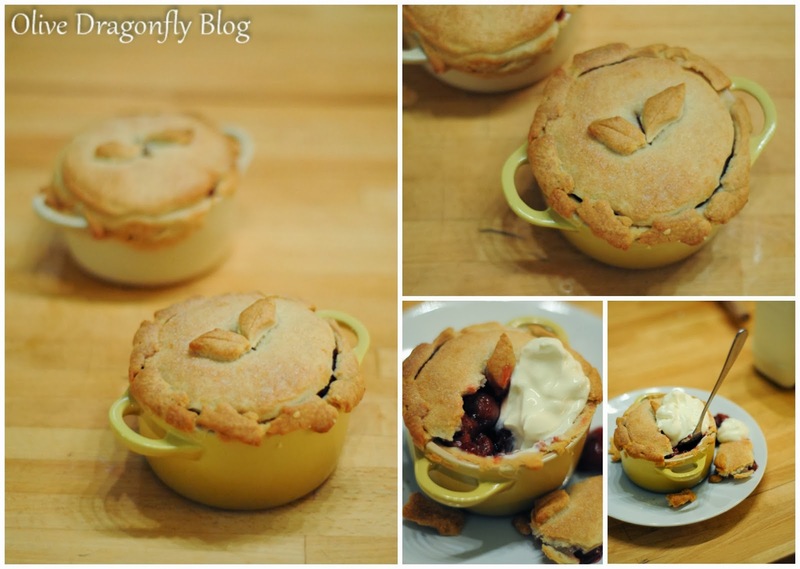 I prefer deep filled pies anyway as I'm not usually a huge fan of pastry.